Well here's something completely different. A subscription service dedicated to remaining fuzz-free. Who'd have thought it? Friction Free Shaving did, actually. 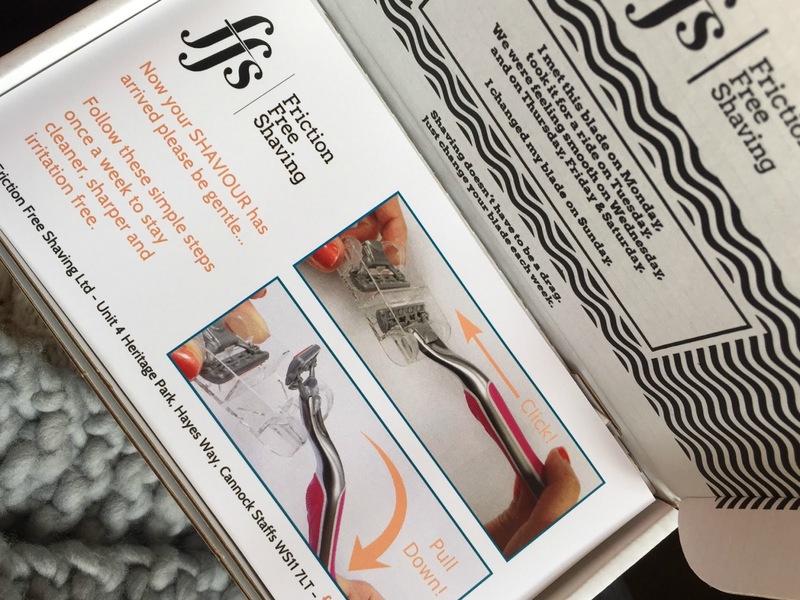 Friction Free Shaving is a monthly subscription box program that delivers razors and replacement blades to your door, for as little as £3 a month. You can choose from three designs - *Samantha, Frankie or Faye. The razor arrives in the post, along with 4 replacement blades. I have Samantha, which has a five blade head. Frankie has a three blade head and Faye has two blades. Samantha is the most expensive razor at £7 per month. Frankie £5 a month and Faye is £3. I'm not fuzzy with my razors in the slightest, so I'd be more than happy to go with Faye for around the same cost as a Starbucks. The replacement blades slip through your mail box once a month. The premise behind Friction Free Shaving is that we should never be stuck using a blunt razor on our pits, legs or lady parts. They have a point, really. Blunt blades are more likely to irritate and even nick the skin (shudder) so fresh blades are the way forward. To be honest, I can't say I've really thought about this that much before and I'm absolutely certain that I've used blunt blades countless times. I love having silky smooth legs but to be frank, I'm way too lazy to shave them every other day, unless it's particularly warm and I am forced to wear shorts. I digress, I think this subscription service is a pretty nifty idea. The fact that fresh blades are readily available has encouraged me to actually make the (very small) effort of changing the blade which has resulted in less irritation on my armpits and my legs. I also like that Friction Free Shaving shortens to FFS, which is an acronym I use on a daily basis. Replacement blades eliminate the need to buy disposable razors, which is obviously better for the environment and the cost effectiveness is notable too. Case in point - just before I received the Friction Free Shaving box in the post, I'd bought one of those Wilkinson Sword Intuition razors that has a bulky moisturising bar all around the top, so you're supposed to be able to shave without soap or shaving gel. Not only did it cost me nearly £7, the moisturising bar all but disappeared after only a couple of uses. In other words, for me personally, it was a major rip off. The Samantha razor from Friction Free Shaving is not exactly state of the art. It's nothing new, but it does the job well and it's made from metal, not plastic, so it's durable. I think this is a pretty great concept overall. You can find out more about Friction Free Shaving here. This is actually such a good idea, I'm honestly horrific at remembering to buy fresh blades!